A door lock can end up being broken as a result of several different factors. Some of these factors might be accidents, and some of them might be deliberate, but regardless of the cause, it is your reaction as a homeowner that truly counts. If your door lock is broken, the problem could be far more serious than you might think, so it is important not to just sweep it under the rug as an everyday occurrence. As a homeowner, building manager or tenant, it can be very easy to overlook things and occasionally allow minor issues to slide. All too often, people get carried away doing this and it might lead one to think that people do not care about security. I get it, we are all human. However, when it comes to a door lock being broken for whatever reason, the issue could end up putting your home security and building infrastructure in jeopardy. If you have read any of my work on here, you will know that I am a major proponent of better front door security, and overall care of front door locks. Many homeowners have the tendency to implement temporary, minor, solutions when they realize that something might be wrong with their door locks. There is also the common misconception that a broken door lock means the lock will look as if it has been shattered into a million pieces. However, in some instances you will not be able to tell that your lock is broken just by looking at it. The problem with a door lock broken could be as simple as an issue with the springs housed within the locking mechanism of a pin tumbler lock. A problem like this will not be visible and can only be spotted upon a proper diagnoses of your lock. If you notice any issues that are causing your door lock to behave in a way in which it normally wouldn’t, you need to take the time to try and find the root of the problem. A residential locksmith can always help you properly diagnose and rectify the problem with your lock if you are unsure how to go about it on your own. There is no hidden science that is meant to help you figure out that your door lock is broken, but there are some measures that can help you diagnose the issue efficiently. The ability to identify that your door lock is broken will help you rectify the problem, and it will reduce the chance of any more damage being caused. One of the easiest ways to spot that your door lock is broken is if it is no longer operable by its designated key. Essentially, if the designated key is not able to unlock your door there is a good chance that there is a problem with your door lock cylinder. I will play devil’s advocate for just a second and say that it is equally plausible that you might have a broken key, but this is easier to spot in comparison to a door lock broken. Make sure that you take the time to properly examine your key so that you can rule it out as a culprit and hone your focus in on the door lock broken. If the key is able to rotate the lock, but does not successfully lock or unlock your door, it is a potential sign that your door lock is broken. Also, if the key does not rotate in the lock at all, it is a telltale sign that your lock might be broken. This is a very different scenario from the one described above, and this might be a more telling sign that the internal mechanics of the lock are not functioning properly. If homeowners take notice of this, they should make sure that they take the appropriate steps to have their door locks repaired. These occurrences are much more common among some of the door lock brands that critics experts to hate. Another clear sign that a door lock might be broken is if the key gets stuck in the lock, or if it becomes increasingly difficult to properly operate, the lock with the designated key. You will notice that the once fluid motion of inserting your key into the lock and unlocking your door is no longer there. It will also be increasingly difficult for you to remove the key from the lock. Paying attention to these signs will help you repair the damage to your lock before it spreads and becomes much more serious. It will also help you prevent damage to any other components that work in conjunction with your door locks. This includes your keys, door, and door frames as well. A broken door lock is not always caused by damage done to the internal mechanism or a broken door lock handle. In some cases, the door lock might be broken because of an issue that arises with the latch bolt that is in place, or some trouble with another aspect of the door hardware. A broken door lock might always be more serious than you think, especially when it comes to your home and your security. Door locks are integral parts of any security mechanism, and they should be given the appropriate amount of care. The dangers of door locks should not only be explored through the lens of security. You should also be aware of the potential damage that broken door locks can cause to other components of your home security. Let’s take a look at some of the reasons why a door lock broken might be much more serious than you think. Starting with the most obvious reason is not really my style, but if we are talking about the reasons why a door lock broken should be taken seriously, then we might as well begin by talking about the ways it impacts security. As I mentioned above, door locks and security go hand in hand and as such, you should be aware of the fact that a broken door lock can leave you extremely vulnerable. This is a much more serious issue if you are discussing a broken front door lock. Essentially, the foundation of your security is now in question, and this makes it much more likely that burglars and criminals will be able to exploit your home security without being stopped in their tracks. This can happen in several different ways. For instance, if your door lock is broken in such a way that does not allow you to fully close your doors, you should realize the vulnerable state that this places you in. Also, if your door lock is broken in a manner that makes it much easier for burglars to pick your lock or use any other bypass measures with ease, you should know that you are in a very vulnerable position. Without a functioning and effective lock in place, your door is only going to be a placeholder and a prop. It will not be able to successfully filter the access people have to your home. Attention is key whenever your are dealing with a broken front door lock. I say this because the only thing worse than not fixing your door lock when it is broken, is not realizing that your door lock is broken. Since we are still in the vein of security, we might as well talk about the ways in which a broken door lock might be an indicator of burglary and crime. Disregarding the signs of a broken door lock can potentially place your home and your family in danger, which could have otherwise been avoided. As I pointed out earlier, one of the easiest ways to see that there might be a problem with your door lock is by being aware that it might not be working the way it is supposed to. However, being able to understand and spot a broken door lock is only one part of the equation. The other part of the equation is being able to understand the factors that might have contributed to your door lock getting broken. One of the most common ways in which a door lock might be broken is through the application of excessive force. This might be committed unintentionally by some homeowners, but it is often a deliberate act by burglars as they attempt to gain access to your home. There is always the possibility that your door locks were able to successfully stand up to the burglars, but there are often signs that indicate that a burglar might have attacked your lock. 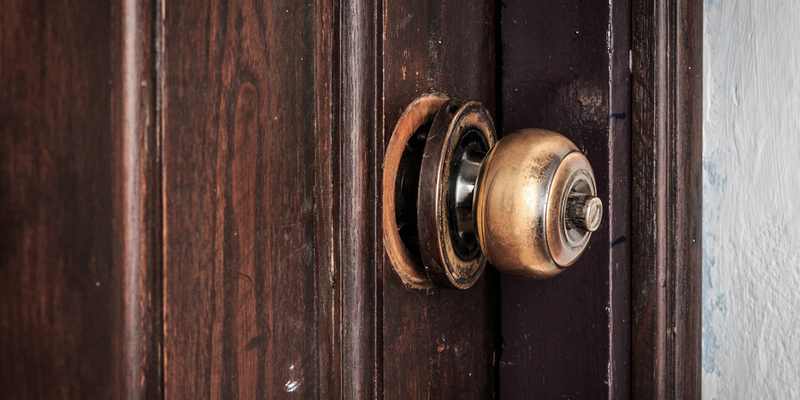 One of these telltale signs is the fact that your door lock might be left broken. If you notice this and neglect it, you are potentially placing your home in great danger, and there are several reasons behind this. The first is that the burglars who attempted to break in before will now have a much higher chance of success than before, simply because they are familiar with your lock and it is no longer operating at the capacity in which it once was. In situations like this, it will be best to change your door lockset so that if burglars do come knocking again (they normally don’t knock), they are met with a completely new lock that they have no familiarity with. This might not sound like an effective security measure, but it will definitely get the job done. You can always opt to have the same lock repaired, but as I mentioned, whoever was trying to break into your home will now have intimate enough knowledge to combat your door lock. 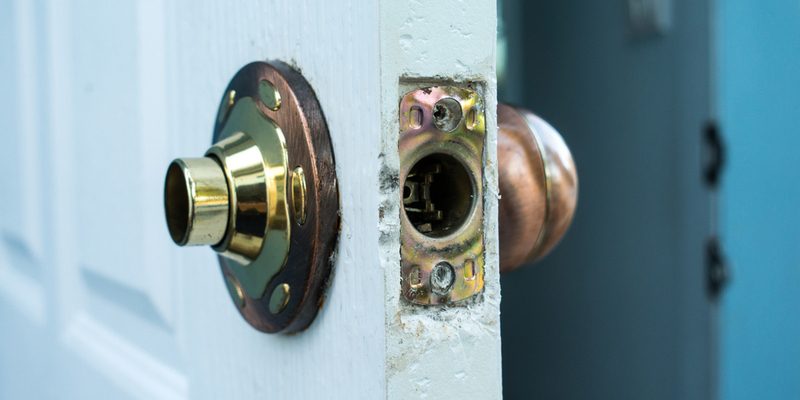 If a broken door lock is neglected for an extended period of time, it has the potential to compromise the integrity of your door and other aspects of your door hardware. This especially goes for homeowners whose door locks are broken but are still somewhat usable. Keep in mind that not every single broken door lock will mean that the lock is broken to the point where it cannot be used in some minimal way. In some cases, a broken lock is just not functioning the way it regularly would. A clear example of this is a door lock that is broken because of a problem that stems from the door latch not being properly aligned. This does not mean that the handle has been separated from the body of the lock or anything quite as graphic. It is in these scenarios that homeowners are tempted to continue using their door locks even though the door lock is broken. Whenever this happens, there is always the possibility that the damage might spread to other parts of the door hardware and effectively damage the door. In this context, door hardware is referring to the other tools and components that are used in conjunction with a door lock to make it work as intended. If you ignore your broken door lock, you will burdened with the cost of changing your damaged locks as well as replacing a damaged door, which could have easily been avoided. This potentially refers to the door frame and the entire door itself. Similar to the section above, we will be taking a look at the ways in which a broken door lock can affect other key elements of your doors infrastructure, no pun intended. Door locks go hand in hand with the keys that are fashioned to work with them and this means that, in most cases, a broken door lock will affect the key in some way or form. This should go without saying, but not all homeowners are aware of the potential risk that a door lock broken poses to other elements like keys. Keys have a very intricate relationship with door locks, and the state of a door locks internal mechanisms can influence the manner in which a key works. If the internal part of your lock is damaged, it could place an increased physical strain on your key, which can in turn lead to the increased likelihood that the key will end up damaged. Having a broken door lock is already enough hassle that some homeowners have to deal with, but if it is not addressed in the right manner you will have to deal with a bigger cost burden down the line. This point is not one that many homeowners have ever taken into consideration, but you need to realize that a broken door lock is a potential emergency hazard, especially if you never attempt to remedy the situation. Time is an important factor in every emergency situation, and it can often be the deciding factor between harm and safety. Door locks that are broken reduce the amount of time that you have at your disposal. This might not sound like a big deal on any regular day but in an emergency situation where you are already pressed for time, a few seconds could be a defining factor. Imagine, if you will, that you need to quickly enter your home to take refuge during an emergency. Your chance of survival or success in this emergency situation will be severely affected due to the fact that you cannot unlock your broken front door lock in an expedient manner. The same can be said for a scenario in which you are locked inside your home. For the sake of this argument, let us say that you are locked inside your home trapped in the midst of a fire (or even a burglary) and you are trying to escape as fast as you can. Your evacuation route will be impeded because of your broken door locks, and this has the potential to place your life in extreme danger. In this instance, and all of the ones described above, your door lock broken is much more serious than you think. If you walk away with anything after reading this, I hope you walk away with the understanding that in the grand scheme of all things security, your door locks do matter. Understand that paying attention is the key to realizing that something might be wrong with your door locks. Make it a daily habit to analyze the way your door locks are working so that you will know whenever there is anything out of the ordinary going on. Constant vigilance and attention will help you take better care of your door locks and your home security, and I hope that I have been able to leave you with that.